Manchester United have been mentioned as among the clubs to have probed Isco over a potential transfer away from Real Madrid, according to sources in Spain. However, Manchester City seem to be in the driving seat to see off competition from their neighbours, as well as from the likes of Chelsea and Liverpool, say Don Balon. Isco has been a key player for Madrid and could easily slot in to most top sides around Europe and the Premier League, and would undoubtedly fill a key role at either United or City. 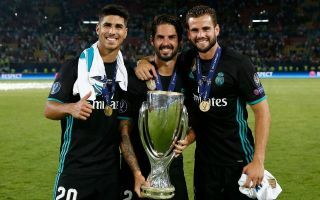 Another recent report from Don Balon claimed United were even willing to part with David de Gea in a swap deal to land Isco, such is their desire to win the race for his signature. Lacking spark and creativity for so much of this season, Isco could be a significant signing for United in their bid to catch Manchester City in the title race next year. However, he would also make a perfect fit in Pep Guardiola’s side and come in as a long-term heir to David Silva. Don Balon state Real Madrid want £70million for him but that City are not currently close to matching that asking price, though the player himself prefers the Etihad Stadium over other possible destinations. Still, there must be some hope for United and others if City continue to refuse to play ball with Real Madrid.